Tony Gwynn died last week and it stopped me. In part it was because he died too soon at 54, only four years older than me and many of my friends who grew up watching and admiring his skill as a player. As is always the case when someone who has been a part of your collective experience goes, there is a new hole in your life, that sense that something’s missing that won’t come back except as a ghost, a haunting memory. But it was more than that. With the death of Gwynn, San Diego lost the last of his kind, a Southern California product who went to school at SDSU, came up with the Padres, and stayed here for his entire career, even when he could have left for greener pastures. In an era of pervasive corporate delocalization in sports and the culture at large, Gwynn was an old school guy who embodied loyalty to his town and his team. You couldn’t really think of San Diego without him. 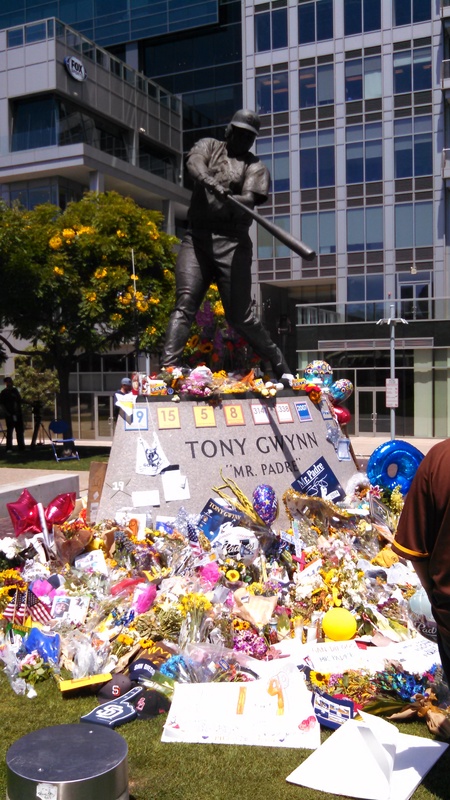 Tony was Mr. Padre, for real–a kind of touchstone of authenticity for a city composed of so many people from someplace else without any rooted sense of place or civic identity, a genuine part of the fabric of the city outside of its constructed image as a sunny tourist paradise. He was a gamer on a team that was mostly bad with some stellar exceptions. Gwynn represented the kind of grit, hard work, and perseverance that most people don’t associate with mellow San Diego. He was a grinder who never won it all but always showed up. He was also a stand up guy who was a nice person off camera. I am only one of the countless number of people who has a story of Gwynn telling the security guards to let the last of the fans in line for autographs stay so he could chat them up and sign a picture or a ball. In this case, he greeted and spoke patiently and personably to each person before he got to my wife and me and shocked us by being able to name the game where the photo we brought with us was shot and what inning it was when he got the hit. Of course, there is nothing particularly intimate or revealing about an encounter like that so I, like most other people who admired Tony Gwynn, loved him the way you love an artist whose work speaks to you intimately though you’ve never met them. And the specific record of Gwynn’s artistry has been amply documented over the last week in the national and local media, so I won’t cite a particular play or at bat, but rather note that what I will always remember most fondly about Gwynn’s career is its latter stages, when he was overweight with bad knees. In those days Tony looked like the kind of guy who had no business being out there playing professional ball but then, with one swing of the bat, stopped and amazed you with an unexpected but stunning moment of perfection. It was that “everyman” quality of Tony Gwynn, grinding it out in order to get that key at bat where he could display the kind of grace under pressure that makes you think you might just be able to do the same in sport or some other context that I most loved. So, like Frank O’Hara staring at the newspaper photo of Billie Holiday in his poem “The Day Lady Died,” I saw that picture of Tony Gwynn in the paper and thought of the moments when he did it just right and everybody and me, stopped breathing. Thank you, Tony Gwynn, for that gift.